Manchester United midfielder Paul Pogba has given his side a 1-0 lead against Everton this afternoon, but he got away with a poor initial effort from the penalty spot. 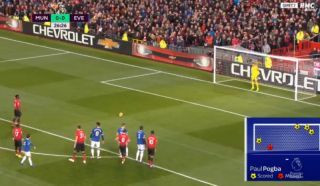 Watch the video below as Pogba’s stuttered run up isn’t enough to fool Everton goalkeeper Jordan Pickford, who saved his first attempt. The France international, however, was on-hand to tuck home the rebound and make it 1-0 in today’s Premier League game at Old Trafford. United have won just one of their last seven games in all competitions so will hope this can be the start of a much-needed three points today.